We are happy to announce that the Iowa Farm Bureau has become a Premier Statewide Partner with Special Olympics Iowa (SOIA)! 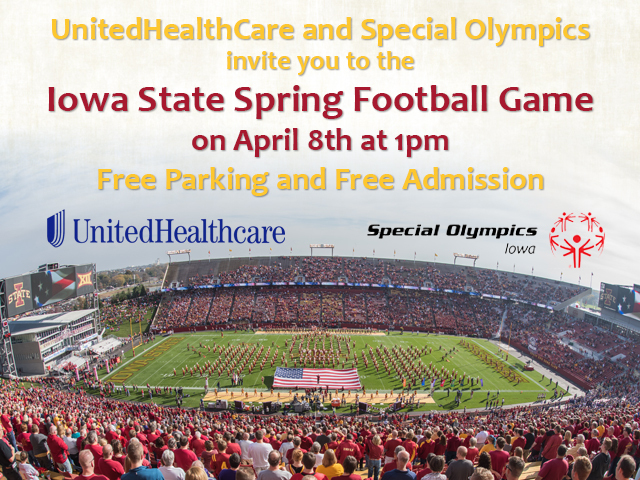 On Saturday, April 8 Iowa State University will hold its annual free spring football game. SOIA athletes and family and friends are invited to attend the game and be a part of a Special Olympics section! The athlete section is being sponsored by Learfield Sports and SOIA Statewide Sponsor UnitedHealthcare. SOIA will be seated in section 25. There will be signage to find the Special Olympics section in the stands. Guests are encouraged to park on the south side of the stadium (S2/S3) and can take the general public elevator up to the East Concourse. No tickets are needed for this event. There will be wheelchair accessible seating. Time: Gates open at noon, game begins at 1 p.m. Details below. Call the state office at 515-986-5520 with questions or email Stephanie Kocer at skocer@soiowa.org.